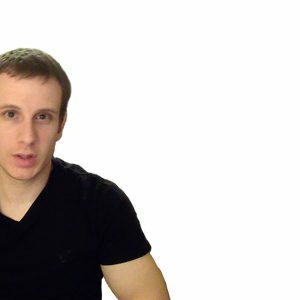 In this second part of a set of April 14 Q & A email responses, Secret Space Program whistleblower, “Corey” Goode (aka GoodETxSG), reveals more information about secret bases on the Moon and classified military space programs. It’s kind of like Antarctica, it has these different areas where different countries and people can say we got this area, and we got this, and everybody respects everybody’s claim or area…. Whether people are friendly or hostile, it’s kind of a neutral territory, so there’s places where those who don’t get along with others, cannot/be not too far from each other. But they don’t attack each other … for whatever reason that the contracts, diplomatic arrangements is for that. Corey also responds to an additional set of May 16 questions I put to him due to comments by a former Defense Intelligence Agency employee, “Christopher,” concerning a classified military space program separate to the programs Corey claims he participated in. Christopher had responded to Corey’s May 11, Q & A email exchange in the comments section. Christopher pointed out that while he was aware of and worked on a classified US Navy Space Command program using military space shuttles, orbital space stations and even additional lunar landing missions, he was not aware of any of the material Corey had shared about extraterrestrial programs, Mars bases, and/or use of psychic personal in classified space programs. A helpful analysis of Corey’s exchange with Christopher in the comments section is available on the Stilllness in the Storm blogsite. Corey’s replies to the May 16 email questions give more details on how various branches of the U.S. military are involved in less classified space programs using traditional rocket propulsion technologies. A good example is the USAF X-37B which today was launched to perform a classified mission in space for up to two years. All involved in this classified Air Force program genuinely believe they are involved in cutting edge space technology. Not so according to Corey. 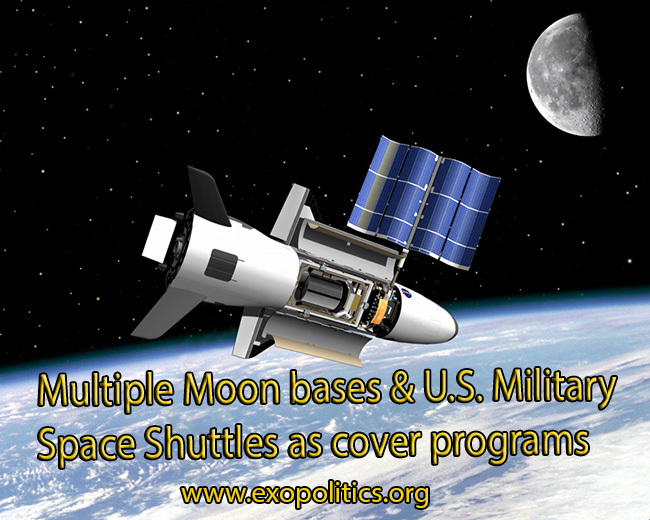 The X-37B program as well as a host of other US military space programs are using outdated space propulsion technologies. This is known only to a select few in military leadership positions who have been read into the more highly classified space programs that Corey participated in. According to NSA documents released by Edward Snowden, the intelligence and military community regularly hide their most classified programs under less classified “cover” programs falling under rubrics such as “Sentry-Eagle.” Essentially, Corey is revealing that classified military space programs such as the X-37B are covers for more highly classified space programs that he directly worked on over a 20 year period from 1987 to 2007. Q17. The famous remote viewer Ingo Swan said that he saw naked looking humans/ETs walking on the moon’s surface. Is there a breathable atmosphere in some parts of the moon? There are many dozens of ET groups based in “Embassy Zones” on/in the Moon. He could have been “Viewing” any number of them. Their uniforms/suits may have given the appearance of them being naked (As a RV practitioner myself I have an understanding of how some of the imagery language translates at times). There is an extremely thin atmosphere that is very near to the surface of the moon (down in craters) and away from the Sun facing side (So it is not constant as the Earth/Moon rotate around the Sun). It is not breathable at all and filled with a fine dust that would rip your lungs apart of you were unwise enough to try (the dust and ice crystals do make for some interesting light phenomena at times). Many people who do Remote Viewing or OBE’s have an experience of being brought to a place on the moon, a sort of gathering place before they travel further out into the Sol System and beyond. This is fairly common and I have experienced it myself. It is not in the physical realm, nor is it a physical place. It is a Heavily Guarded and Secret Base that is at about the 10 o’clock position, on the Back Side of the Moon. The portion that is visible is a “Trapezoid Shape”. It is only accessible to the Dark Fleet and some ICC Personnel as well as the Draco Allied Forces. Some amateur astronomers have caught video of swarms of craft leaving from this base location on a couple of occasions. It is presumed to go far beneath the surface of the Moon just as the LOC does. Other than what was explained above about the diplomatic zones and embassies I do not have much more information. There are quite a lot of ancient ruins from previous disasters and wars that are left on the Moon as a memorial both to the “Ancient Builders” and to the long term peace that has been maintained on the Moon. At times these ancient ruins are open to be visited but are mostly “Protected” and off limits. I do not fully understand why this is the case but these ruins are spectacular and highly respected. No, the Sphere Alliance are 6th through 9th Density Beings that do not inhabit the Spheres, Use the Spheres as Vessels, Require Technology to Travel or a Base of Operations. When they are not here interacting with us they are either back at their home density or are around us in a phased out (Different Frequency) state that makes them invisible to us. They observe and interact with us at will and then travel back to their home Density by just a “Thought”. Many of our Density are having a very difficult time understanding the existence and abilities of a group from 6th through 9th Density Realities. We have no way to begin to fathom the way they perceive us or our behavior in our Density. Everything is Vibration… Energy, Matter and even Thought is all Vibration. They can control matter and energy’s vibrational state by their thought/consciousness and without the need of technology. Some of the beings that are extremely advanced and are 4th through 5th Density Beings still have some of the same limitations we do even though they are much more advanced. These beings are not used to dealing with other beings that are so much more advanced than they are. This Outer Barrier is something that has contained even them within our Sol System. Q23. You have responded to questions (Article Comments) by a former DIA employee, “Christopher”, concerning an intermediate level of classified space programs comprising the US [Naval Network and] Space Operations Command and the USAF Space Command. You say that this intermediate level [compartment] was not given need-to-know access to the Solar Warden and other space programs with off-planet activities. Is this basically because this intermediate level [compartment] of classified space programs has been denied access to anti-gravity technologies and space craft? Yes, There is a break away civilization and a completely different control system that very few are privy to. Those that are in the National Military Black Op’s Programs are not read into the full picture of what is going on. They are given various cover stories and told that the things they track are our technologies from other black programs. They are spending Trillions of Dollars on lower technology that has its roots in the 19th/20th centuries with mainly advances in electronics and material sciences. The LOC does their best to control traffic to make sure that none of these groups observe technology that they are not supposed to know about. Those who fly manned space planes that sometimes dock with the ISS and other secret space stations of lower tech programs sometimes observe craft that they are not supposed to and they are debriefed and sworn to secrecy usually knowing more about what is going on in outer orbit than their commanding officers. These personnel are often pulled into the Advanced Secret Space Programs once they reach a certain amount of first hand experiences. Recently some of these groups that would swear that they were at the top of the pyramid of the military space programs and have the highest clearances have been invited to the LOC for some of the Alliance Conferences. Their reactions were the most interesting of all. They sat with their arms crossed and kept to themselves with wide eyes and slightly upset looks on their faces. They of all people asked the fewest questions during the conference and left quickly without fraternizing with their new colleagues. Q25. The former DIA employee, “Christopher”, says that the US Naval Network and Space Operations Command, partnered with the Defense Intelligence Agency, while the US Air Force Space Command partnered with the CIA. Given the CIA’s role in covert operations sanctioned by the Cabal/Illuminati, would it be fair to say that the senior officials in the USAF Space Command are more likely to be compromised and ally with the “Dark Fleet” and illegal ICC activities such as lying to recruited scientists and personnel about off-planet working conditions? Not necessarily, the personnel I worked with ranged from a majority of MILAB Program Trained and “Drafted” persons to a full representation of all of the services (including the Coast Guard in some cases believe it or not). These were often mixed military forces security teams and operatives working together based on their strengths and what they have to offer the program. For the most part the personnel were raised through MILAB Programs and trained from their youth and later drafted into working in either the SSP, Secret Earth Governments or their Syndicates. I am sure this is different in each of the programs however. The DIA, CIA, NSA or any of the other intelligence services never flashed badges or ID’s around outside of our orbit. These Intelligence Agencies have no oversight, control or knowledge of what these Advanced Secret Space Programs are doing. There are other intelligence agencies associated with each of the SSP’s as well as Military and Command Structures that do not report to Earth Based American or Western Governments. This is of course because we are talking about a complete break away civilization that does not exist according to even the American Shadow Government and their black op’s programs. There are multiple Secret Earth Governments and their Syndicates (made up of Occult Groups and Secret Societies) that secretly run much of the Off World Commerce as well as are the real people in charge of the publicly seen governments on Earth that people think they vote for and take part in. Q26. Would it be accurate to say that senior officials within the US Naval Network and Space Operations Command are more likely to be aligned with the Solar Warden space program even though the rank and file personnel (e,g, “Christopher”) aren’t briefed about the antigravity spacecraft and off-world missions? I do not think that it was a coincidence that a person claiming to be a former DIA Agent living in Russia (there is a growing ex-patriot community of former American Intelligence Personnel in Russia and a couple former Soviet Republics) commented on the Military Black Op’s Space Program that was also a part of the Strategic Defense Initiative (SDI) Era. We may hear from him or another one of them again after this article is posted. Regarding your question, this has recently changed. These people in the past feel into the groups (except for a select few) that were only aware of the Military Secret Black Op’s Programs. They were not aware of a completely separate Break Away Civilization that was so much further advanced than they are that they are not even a part of our society or governmental structures. When some of these select people that were involved in the Military Black Ops/Space Program were found to be involved in the “Earth Based Alliance” they were invited into the “SSP Alliance”. They began traveling to the LOC (that they didn’t know existed) for the first time during the same time as the first group of “Earth Based Alliance Politicians” and the 70 civilians that were invited to attend a separate conference and tour of the LOC. This is a fairly recent development and they are adjusting to the change as well as for the first time working as liaisons between the Earth Based Alliance and the SSP Alliance (who have different agendas). Q27. On June 11, 1985 Ronald Reagan wrote in his diary, “our shuttle capacity is such that we could orbit 300 people.” Was Reagan here referring to the intermediate space program run by the US Navy and/or US Air Force, rather than the Solar Warden or other four secret space programs that you have previously described? There is a craft that is a personnel transport shuttle that transports 300 people when carrying lower deck cargo or near 600 people when transporting personnel only. I believe Regan was most likely referring to some of the Military Personnel Carriers that was designed to deliver just below 300 Special Operators and their Equipment anywhere in the world in less than an hour. It was a part of the Military Black Op’s SDI Space Program. It was a rapid deployment shuttle for extreme circumstances and could deliver Delta/SEAL Teams/Forces undetected via this secret craft that was a huge Stealth Shuttle with Electro Static/Magnetic Gravity Cancellation. I do not know if it was ever used. Q28. In your response to Christopher (In Articles Comments Section), you say, “The Secret Earth Military Programs that have programs that are developed for secondary “Disclosure” reasons.” What do you mean by “secondary disclosure,” would this be part of a false flag alien invasion scenario aimed at deceiving the public? Yes, Not only are there often multiple programs run under the same “Program Names” (Example “Pegasus”) there is also a level of the Secret Earth Governments that if it becomes necessary, would have outed the Military Black Op’s Space Program (SDI Era Technology) as a faux disclosure to throw anyone investigating them off of their scent. This would placate the people who were digging for “The Truth” and keep the existence of their “Secret Break Away Civilization” hidden. The use of multiple program names is handy in a similar scenario. If you are called before a senate hearing about a project name that some have provided information about and stated that crimes against humanity have occurred and Alien contact has occurred etc… They can pull out the related project name and history and show that it is a classified satellite program and disclose all of the documents to an intelligence committee of that congressional hearing. They can then bury the other project by the same name in plain sight and carry on as if nothing occurred. They have an amazing number of tricks to keep their secrets and making people look like fools or ruining people’s lives, to do so is nothing they will lose sleep over. This is something that especially those in some of the highest placed military black op’s programs and intelligence agencies will not ever allow themselves to believe. They will not ever believe it is possible unless some of the recent people read into the SSP Alliance Conferences have verified this information to them (if they have a need to know). Dr. Peter David Beter – Audio Letter No. 29. Reblogged this on Dragonstrike-Black Ops.